We offer a wide selection of supplies that can be used for any event or celebration. We have décor pieces that can be rented, and we offer balloon services and custom vinyl creations, confetti and cake toppers and we can special order any supplies that you might need to complete your perfect day. 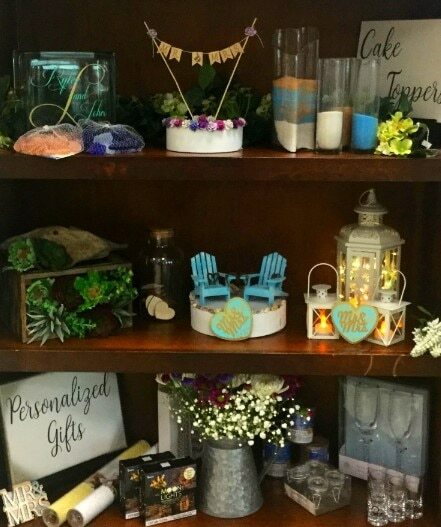 We're also very excited to offer an onsite DIY room, where you and your guests could gather to spend time creating favors, centerpieces, decor and gifts. Consider booking a Wedding Craft Bundle. If you’re not planning a trip or cannot bring your guests with you prior to your wedding, we’re happy to ship a box containing all the supplies necessary to create your favors from the comfort of your own home and within your schedule. Please follow this link to see some of the supplies that we offer: Wedding Supplies.